Today's This OR That is a double feature because I just could not wait another week to show case my great finds. I am obsessed with all things spikes and studs. I especially like wearing them with something a bit girlie and soft for contrast. You may rember the Zara clutch form the last Weekend Wants. I fell in love with this little gem, but at $89.90 it was a bit pricey for me. I did a little digging and found this Forever 21 version for just $26.80. Same with the amazing CC Skye bracelet, just did a bit of research and found this very similar one at ASOS for only $13.26. I would love to see any of your This OR That Finds! 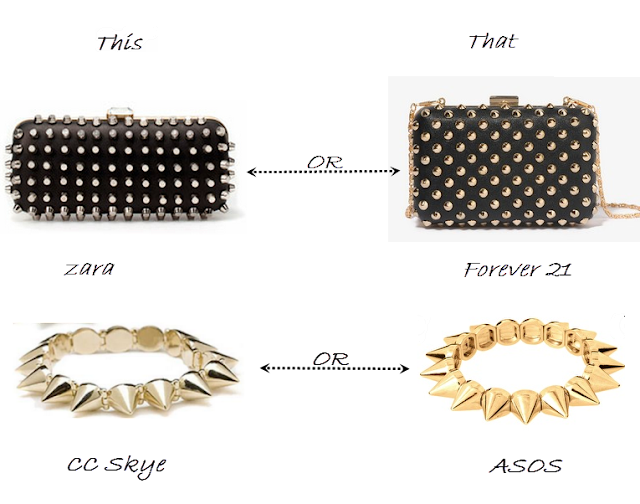 I like the clutch from Forever 21 much better! Yes I agree I got this bag and I like the gold spikes much better.